Operation IceBridge has been a subject of interest over the past two weeks in different parts of the world, with a presentation in Copenhagen on the mission’s recent work and the Antarctic campaign science operations meeting in Seattle. At a meeting of the U.S.-Denmark-Greenland Joint Committee in Copenhagen on June 13, U.S. Embassy public affairs officer Robert Kerr delivered a presentation on the cooperative education and outreach efforts that took place during the 2012 Arctic campaign. During his presentation, Kerr talked about the joint effort between NASA, embassy personnel, and people from the Danish and Greenlandic education ministries to provide a research experience for Danish and Greenlandic teachers. He also spoke on their work getting journalists on board the NASA P-3B and showed examples of upcoming articles by a Danish reporter. 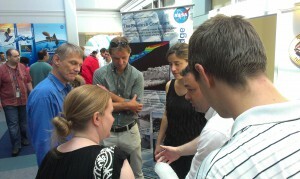 The IceBridge science and instrument teams held their 2012 Antarctic campaign planning meeting in Seattle from June 20-22. 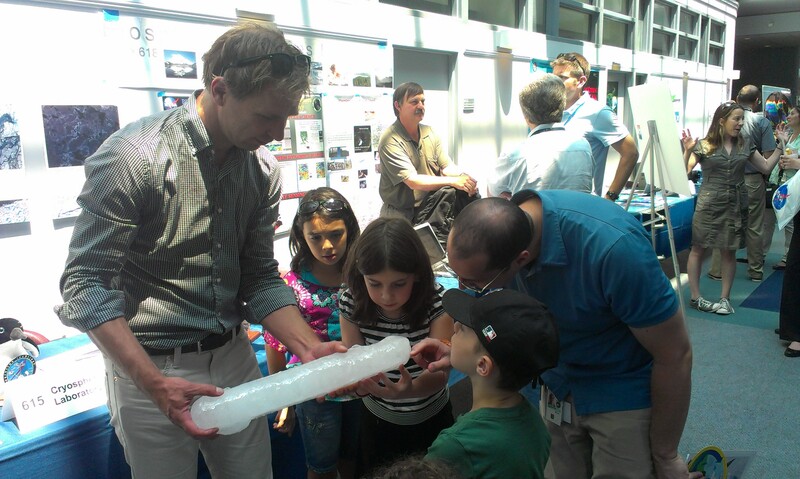 The meeting featured speakers from the IceBridge science and instrument teams, the Cryospheric Sciences Laboratory at the NASA Goddard Space Flight Center and from NASA headquarters. 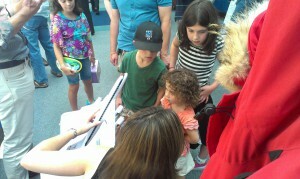 There were also planning sessions for the upcoming Antarctic campaign. Speakers talked about the various IceBridge instruments, the 2012 Arctic campaign, NASA’s overall vision for IceBridge, the future of the mission and the status of ICESat-2, scheduled for launch in early 2016. 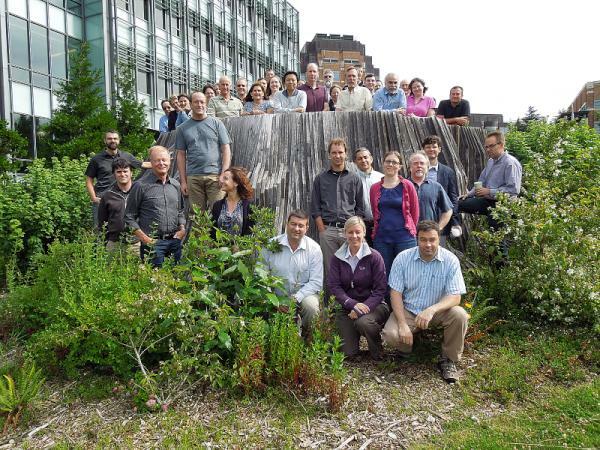 IceBridge science and instrument team members at the Antarctic campaign planning meeting at the University of Washington in Seattle. Credit: Hajo Eiken/ University of Alaska – Fairbanks. 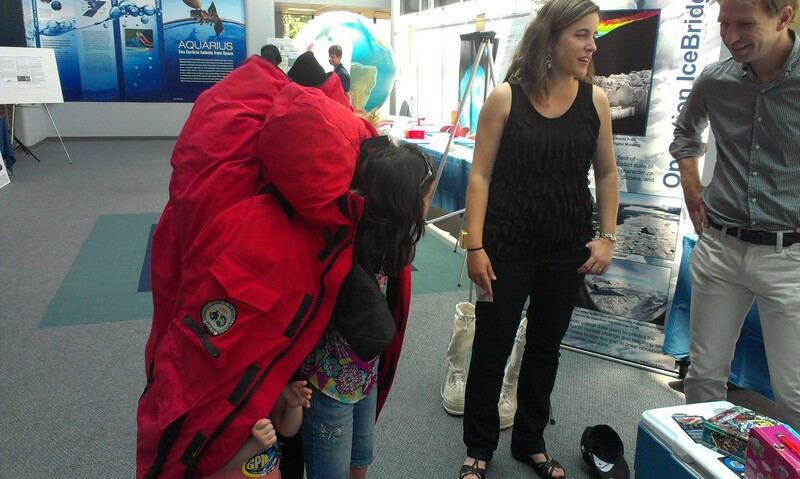 During the breakout planning sessions, team members summarized the collected mission plans for Antarctica, identified the need for additional missions and discussed future directions and potential new measurement requirements. The IceBridge science meeting is one of many steps on the way to the Antarctic campaign scheduled to start later this year. Our flight today, Oct. 28, was a partial repeat of a mission conducted last year. The flight was to take place at 1,500 feet along the western edge of the Weddell Sea following the Antarctic Peninsula, turning south and east along the Ronne Ice Shelf, then heading north into the central Weddell Sea. The primary instruments used on this flight were a specially designed suite of laser and radar altimeters for measuring the thickness of the snow and ice underneath. I began my journey in the cockpit of the NASA DC-8, my first time seeing what all is involved in bringing a large aircraft from the runway into the sky. We took off on schedule flying briefly around the countryside surrounding Punta Arenas, heading back over the airport ramp to calibrate some of the instruments. 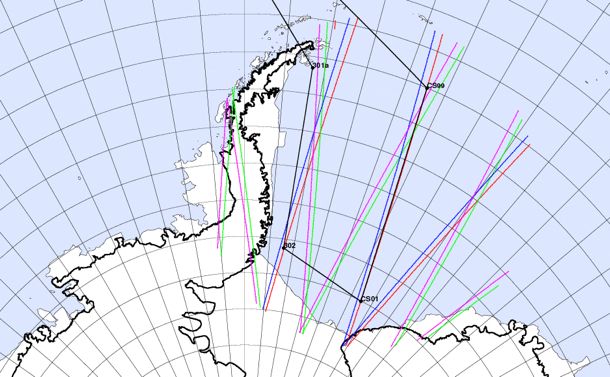 We then started our push towards the Weddell Sea. Along the way there were spectacular views of the normally cloud enshrouded mountains and glaciers of Tierra del Fuego. Even at an altitude of 18,000 ft the 8,000 ft peaks looked a bit too close for comfort, but the calmness and confidence of the pilots helped rid my mind of any thoughts of catastrophe. After a couple hours transiting through serene blue skies we spotted the Antarctic Peninsula and began our descent to low altitude. My first ever science flight to the polar regions from two days ago was still fresh in my mind, but the view of the pristine landscape still captivated me. As we passed over the peninsula, there were breathtaking views of jagged brown mountains, bright white snow, sky blue glacier ice, and murky black water all mixed together in a chaotic jumble. I was struck by how truly remote and harsh the world down below was. A place only for well prepared humans and the hardiest of animals. Despite the uninviting look of the land below, I couldn’t help imagining what it might be like to ride a sled or go skiing down some of the mountains. As we left the peninsula, we passed southward over still waters filled with icebergs, finally entering into the sea ice region to begin our science mission. We first entered into a region of small sea ice floes which had been broken up by wind and waves. The aircraft instruments showed the surface and air temperatures were near the freezing point, probably the reason for the absence of any newly growing ice in the open water areas. As we continued our flight southward we entered the consolidated ice cover of the western Weddell Sea. The region we were flying over today is some of the thickest and most compact ice in the Southern Ocean. The vastness of the sea ice cover became readily apparent as this leg of the journey consisted of miles of ice extending into the horizon in all directions. The area was a mixture of open water, freshly grown ice, smooth areas, rubble fields, ridges, and many other ice types each with intricate geometries reflecting the physical processes which shaped their formation. 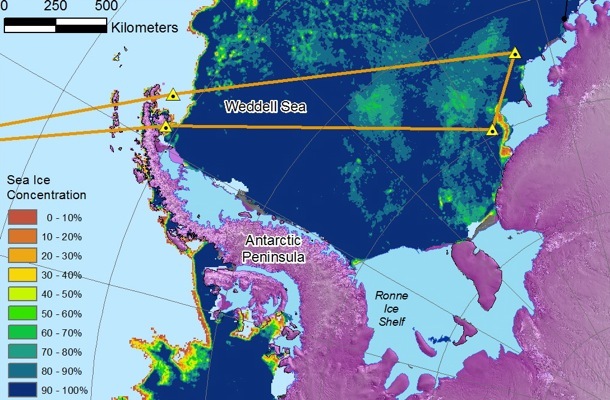 Towards the end of the peninsula region we turned east following the outline of the Ronne Ice Shelf. Though we couldn’t see it in the distance, evidence of its presence was all around us as numerous icebergs could be seen. The huge size of the icebergs dwarfed the surrounding sea ice, but the icebergs were held steady inside like giants chained into a prison of sea ice. The sea ice itself looked benign and serene, like a vast unmoving and unchanging landscape. But looks can be deceptive as the aircraft instruments showed temperatures of -10 C and 60+ mph winds outside. Telltale signs of the force of wind and water acting on the ice could be seen in the piled up and crushed ice of the ridges. 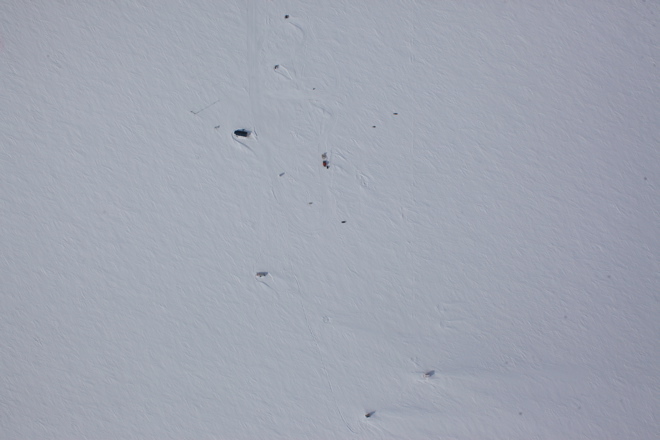 The wind had also blown the snow into patterns called sastrugi, some of them looked like flowers dotting the landscape. 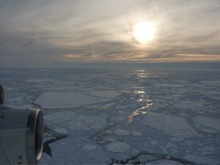 The plane marched on relentlessly throughout the day as miles of sea ice passed below us. The last leg of the science portion of the flight took us underneath the orbit of CryoSat-2, a radar altimeter launched earlier this year by ESA. One goal of this mission was to collect coincident data between IceBridge and CryoSat-2 for doing intercomparisons between the various altimeter data sets used in cryospheric research. We were a bit ahead of schedule however, so we looped back over portions of our flight line to ensure that we were still collecting data when the satellite crossed over. Finally, as the sun hung began to sink low on the horizon, hundreds of miles above us CryoSat-2 passed silently overhead covering hours of our flight track in a matter of minutes. We continued flying northward a little while longer towards the edge of the ice pack where the ice became less consolidated and more broken up. Our mission finished, we climbed high into the sky and sped back to our temporary home in Punta Arenas. It’s difficult for me to tell much about the ice cover properties from the limited perspective of my human eyes, but memories of the journey will remain with me for a long time to come. An enduring and detailed record has also been written into the hard drives of the IceBridge instrument archives. 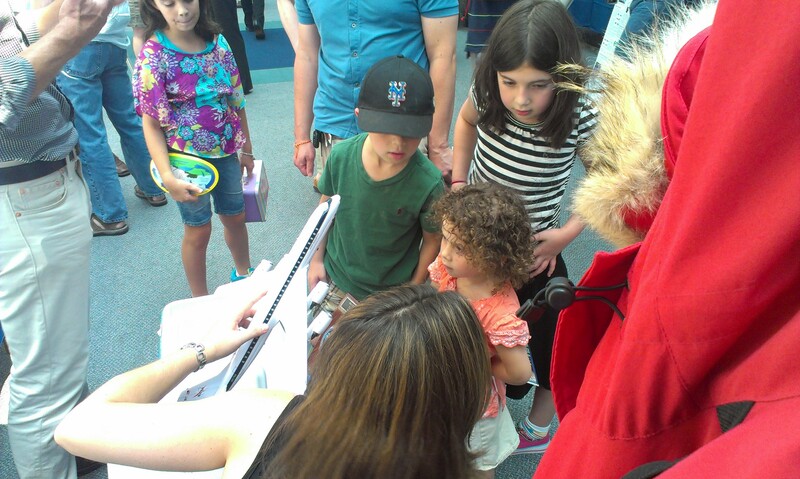 I and other scientists are eagerly anticipating doing a thorough analysis of the data collected. Hopefully it will tell us more about what we saw today and how this record can be used to enhance our understanding of the climate system. 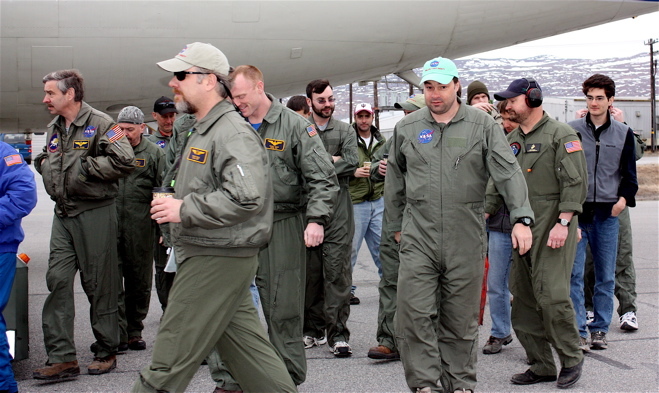 NASA and university partners returned from Greenland on May 28, concluding Operation IceBridge’s 2010 field campaign to survey Arctic ice sheets, glaciers and sea ice. 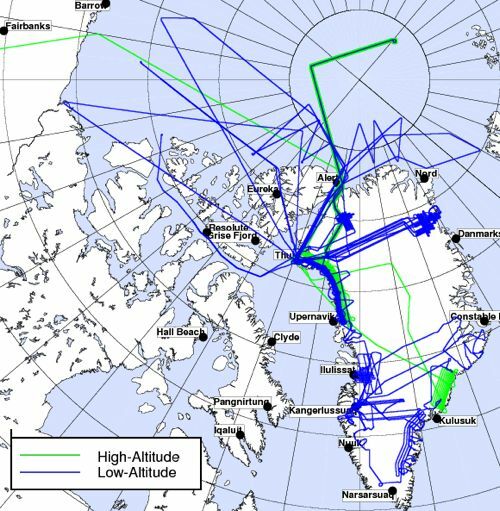 IceBridge — the largest airborne survey ever flown of Earth’s polar ice — has now completed two successive Arctic campaigns, adding a multitude of new information to the record from previous surveys. Continue to follow the IceBridge blog and twitter feed to read updates as science results emerge. Also hear from scientists already planning the return to Antarctica this fall. 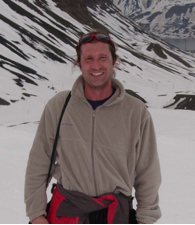 IceBridge project scientist Michael Studinger, recently back from the field, offered words of thanks to those who helped made the 2010 Arctic campaign a success. 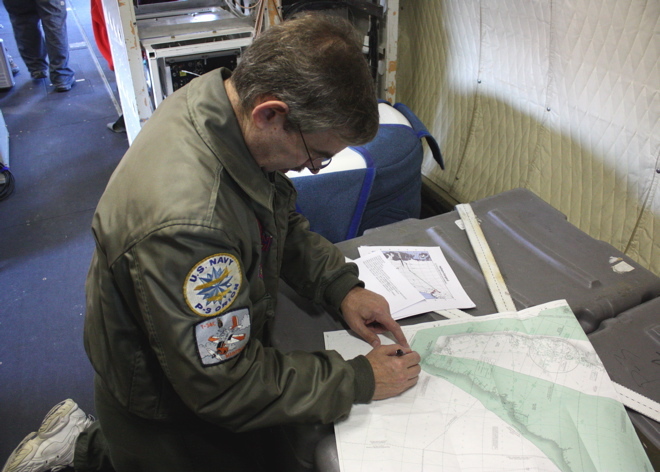 My involvement with Operation IceBridge comes from a desire to better understand the polar climate and the climatic changes that are evident there. 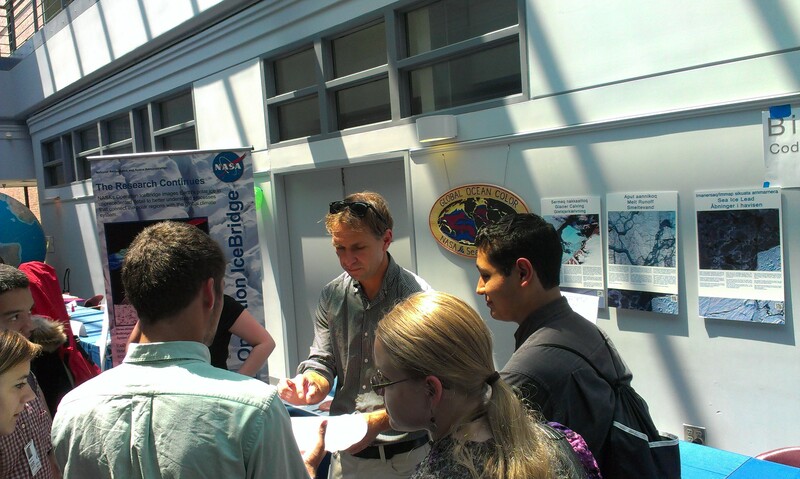 I have been working with NASA through the last five years as a system engineer for the Constellation project, while working to complete my doctoral dissertation in Aerospace Engineering Sciences at the University of Colorado in Boulder. I have also been recently involved with airborne remote sensing and LiDAR systems by completing a three year, NASA-funded research campaign that involved flying a small Mooney M20K aircraft to the Northwest Territories, Canada to better understand noctilucent clouds through synchronized observations with NASA’s Aeronomy of Ice in the Mesosphere (AIM) satellite. 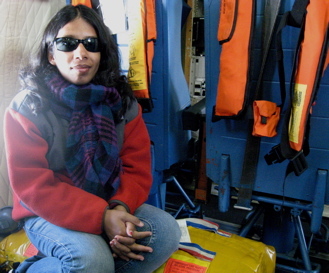 This has been my first campaign with the project, participating in sorties based out of Kangerlussuaq, Greenland throughout the first two weeks of May 2010. 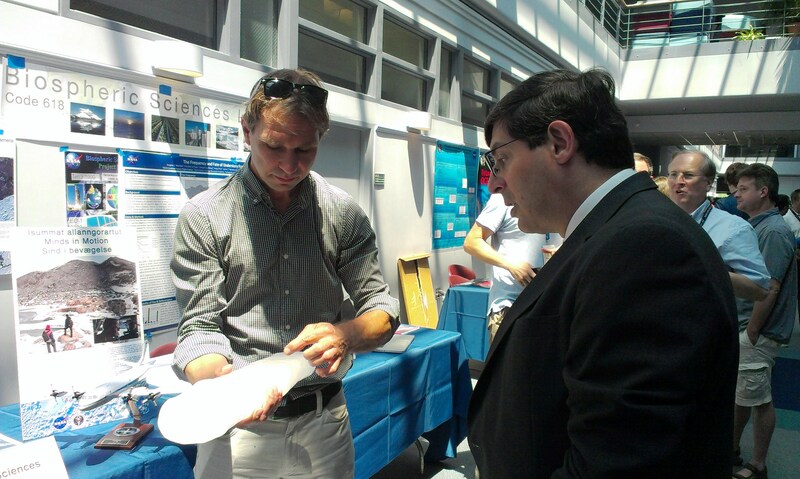 To me, the project is a unique synthesis of personal interests — from polar climate observation and analysis, aircraft operations, remote sensing and instrument design, and flight research campaign planning. My role this year has been principally as a student with the intent to integrate the data that we collect with satellite and ground station data to better characterize glacial evolution, though I hope to become much more involved with the operations of future campaigns. Seeing Eastern Greenland for the first time through the P-3’s windows, as its four engines lifting the aircraft easily over the sharp mountainous ridgelines and its strong airframe holding up to the constant moderate turbulence of the coastal winds being channeled through the fjords, was spectacular. I really got a strong sense of contrast between experiencing the stark minimalism of the ice cap and experiencing the aggressive terrain of the eastern fjordlands. The long flight trajectories we conducted there gave me a sense of the incredible diversity of the terrain and the low altitude of the flight plans gave me a connection to the environment not available at higher altitudes, even down to viewing the tracks of polar bears! 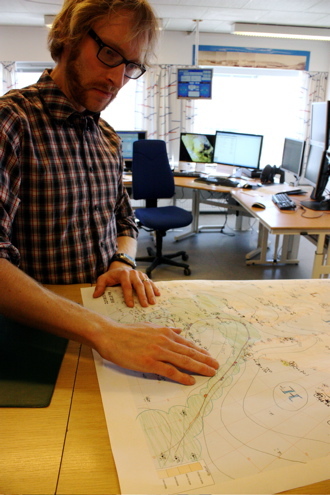 I have been very grateful to all the team members that have spent time with me to explain in detail the systems that they are responsible for, specifically the LiDAR systems, the photogrammetric systems, and the RADAR systems. Also, NASA pilot Shane Dover clearly explained to me the systems unique to the P-3 from a pilot perspective, which was of keen interest even though I may never log an hour in a P-3. In particular interest to me was the way John Sonntag was able to modulate complex flight plans onto ILS frequencies, providing the pilot a very logical, precise display to aid in navigating through both the numerous winding glaciers and the long swaths of satellite groundtrack. This has truly been an amazing personal experience, but upon hearing the excitement that many of the world’s top glaciologists have voiced about Operation IceBridge during my time in Kangerlussuaq, I’ve been proud to be a part of the team. On May 14, 2010, scientists working from Kangerlussuaq, Greenland, with NASA’s IceBridge mission observed ice calving from nearby Russell Glacier. Credit: Eric Renaud/Sander Geophysics Ltd.
IceBridge scientists spend many days in flight surveying the snow and ice from above. On research “down days,” some scientists use their day off to take in the sights. On Friday, May 14, a group of scientists with Columbia University’s gravimeter instrument — which measures the shape of seawater-filled cavities at the edge of some major fast-moving major glacier — made the trek out to Russell Glacier. In the right place at the right time, the group witnessed a calving event that sent ice cascading down the glacier’s front. Read more about the group’s trek in a blog post by Columbia University’s Indrani Das, and watch a time-lapse video of the calving event composed by Renaud. Scientists have long been tracking Greenland’s outlet glaciers, yet aspects of glacier dynamics remain a mystery. One school of thought was that glaciers react to local forces, such as the shape of the terrain below. 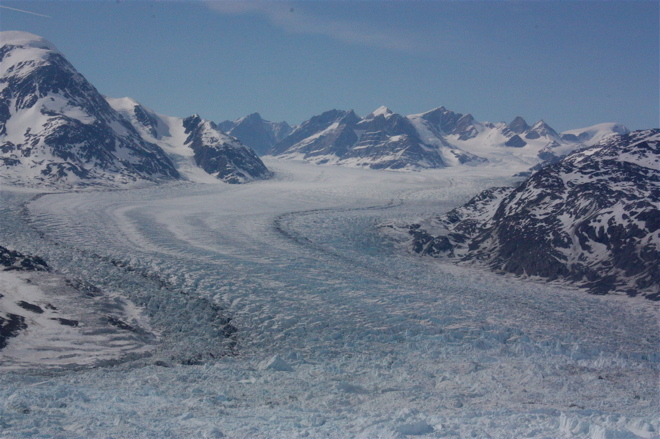 Then, researchers noticed that glaciers in different regions were all thinning together, implying a connection beyond local influences. 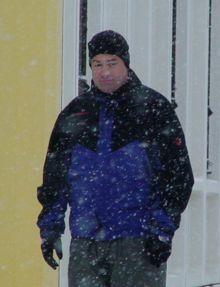 Scientists have posed theories about what that connection might be, but the jury is still out. Recently, the landscape in southeast Greenland has started to change. Helheim Glacer, which was thinning at 20-40 meters per year, slowed dramatically to just 3 meters per year while thinning of the nearby Kangerdlugsuaq also slowed. Further south, two neighboring glaciers showed the opposite trend and started thickening by as much as 14 meters per year. Neighboring glaciers behaving in similar ways implies a connection, but what exactly? The IceBridge flight on May 12 will help scientists learn how changes to outlet glaciers affect the ice sheet inland. 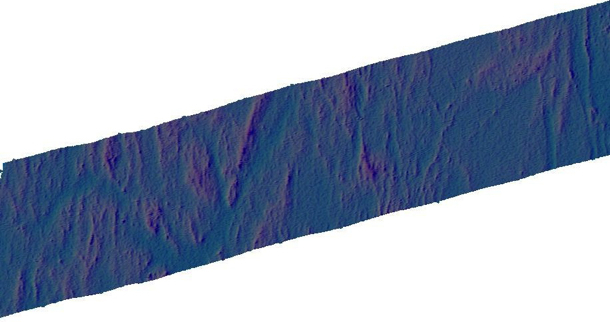 Instruments on the P-3 surveyed in detail three southeast glaciers: Fridtjof-Nansen, Mogens North and Mogens South. Next they flew four long lines mapping changes near the ocean and up to 60 kilometers inland, capturing the extent, if any, at which thinning near coast reflects on changes to the ice inland. It’s an important connection to make; while the loss of outlet glaciers alone would not contribute much to sea level rise, loss of the ice sheet could have a dramatic impact. KANGERLUSSUAQ — The evening before the second science flight, IceBridge scientists Michael Studinger and John Sonntag visited Kangerlussuaq’s weather office — a small building adjacent to the town’s grocery store. Weather can make or break a mission, as clouds interfere with instruments’ ability to map the ice. Mission managers selected the Helheim-Kangerd flight plan, which called for mapping two of three glaciers deemed “the big three.” (The third is Jacobshavn, to be surveyed in a separate mission). 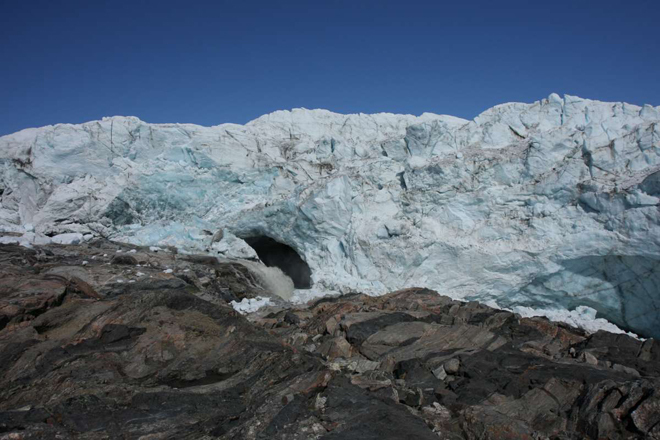 Helheim and Kangerdlugssuaq glaciers are quickly accelerating, speeding up ice loss to the ocean. Steep beds and the influence of saltwater working its way under the glaciers are thought to be playing a role. 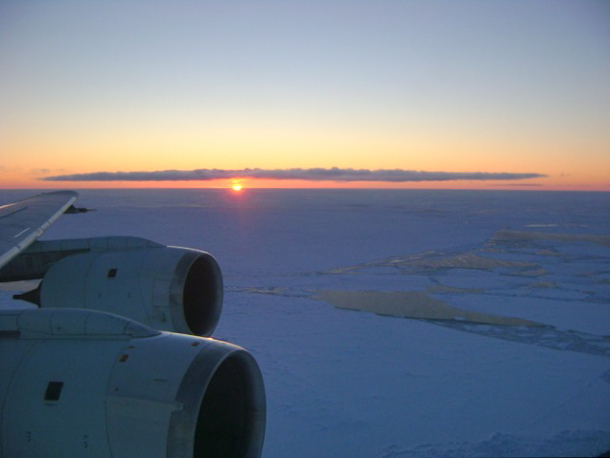 Annual data collected during IceBridge will help scientists maintain a record of the ice loss and learn more about the factors driving the change. After mapping Kangerdlugssuaq, the P-3 passed over a ground team on an expedition collecting ice cores. The overflight was intentional — multiple sources of data over a single location can prove useful for calibrating data and for research. Similarly, IceBridge flights frequently reexamine tracks previously observed by the ICESat satellite. The ice coring crew was caught on camera (below) by the Digital Mapping System — a digital camera mounted in the underbelly of the P-3.